When you look into your oh so adorable best friend’s face and see that cheerful Pit Bull smile, you know what they want…. Yes, they want to go for a run or take you down to the park to play catch, or maybe just leap onto your lap for some cuddle time. And how can you deny that sweet face? You can’t! Ask any Pit Bull owner and they will tell you what is so absolutely lovable with this breed. Known for their athletic nature, they are curious, loyal and loving. Pit Bulls are indeed a loving breed that truly deserves the best. And what better way to show your devotion to your animal friend than giving them top quality care. For many dog owners, that care begins with finding that perfect collar. If you think about it, the collar is one of the most used apparel pieces for any dog. It must be comfortable, it must be durable and it must have lots of personalities. Here we’ve scoured and researched the internet to find you the top 5 best collars for Pitbulls. These collars are selected for a Pit Bull’s unique physique and the needs of a natural athlete. Remember when I said a dog’s collar should have loads of personality? Well, this collar has that fashionable look in spades. 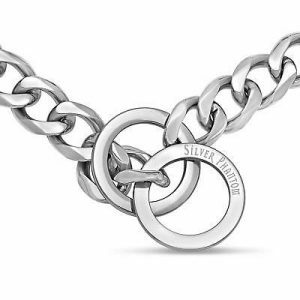 Made from wide and smooth stainless steel metal links, the polished metal and sturdy good looks will look gorgeous on any color of fur. Ideal for the friendly Pit Bull who needs to be kept safe with gentle restraint and feel secure at the same time. Smooth and comfortable – Extra-wide links made of cool stainless steel that won’t pinch or pull fur. This collar will provide your Pit Bull buddy maximum comfort. After following instructions for measuring the width of your pup’s head, you can choose from a wide variety of sizes for a perfect fit. Rust free and tarnish free materials (316 L stainless steel metal) – How many times have you walked your friend in the rain and drizzle? Well, there is no need to worry about your outdoor adventures leading to a ruined metal collar. This steel metal will not rust or tarnish. Always sparkling, always polished just like when you first purchased this beauty. Indestructible – Well-made with heavy-duty welded metal links certified to hold the most powerful dog. This collar is guaranteed to hold up to an incredible 680 lbs. Summary: A collar with a stylish design and sturdy no-tarnish metal that matches the muscular appeal of the Pit Bull breed. Check Silver Phantom Jewelry Dog Collar now from Amazon! The Black Rhino Comfort Collar is all about the comfort with a padded lightweight lining. When you’re on a walk, does your Pit Bull bestie like to sniff every tree, blade of grass all while dragging their paws? Then you’ll want to think about ways to gently re-focusing and guide your dog. That’s where having a soft padded neoprene lining can help protect the sensitive neck area from scratches and cuts due to constant tugging. Bright colors emphasize a sporty attitude with lightweight and weather resistant materials. Light and Comfortable – A construction so light your dog will barely notice it’s on. Perfect for sensitivity issues and a finicky personality. Padded lining in each collar will feel less noticeable to your dog whether they are having an adventure or snoozing the day away. Weather resistant and durable- Pit Bull collars need to use lasting and durable materials, and that’s where this product really comes through. The collar is made to endure the strength and wear of a high power breed along with a Neoprene lining that dries quickly. This collar is lightweight and crafted with heavy-duty hardware that resists both weather and repetitive use. Safety features – There are many times when you’ll need to take extra care to make sure your dog can be seen. One of your safety options is to use a collar such as the Black Rhino that has reflective stitching. It can be used for outdoor evening walks or in general areas with low visibility. This is just a smart way to go considering the number of accidents with dogs and cars. It’s an effective way to alert drivers and bicyclists of your presence and greatly increase the ability for others to see you. Summary: The Black Rhino Comfort Collar hits all the right marks for an adventurous dog. With its reflective stitching, padded lining and lasting construction, you’ll feel free to explore the outdoors day or night. 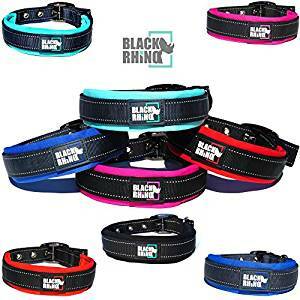 Check Black Rhino Padded Dog Collar now from Amazon! Most of us love the way leather becomes softer and more luxurious as time goes on. 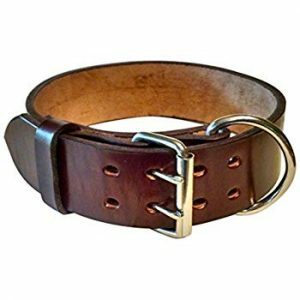 The large breed leather dog collar is a very classy choice for your Pit Bull. Leather promises beauty and comfort, a timeless handsome collar that will set you and your pit bull apart. This is a handsome and wide collar that provides bully breeds extra neck support. Multiple hooks will make sure your best friend has not just a fashionable flair, but an exceptional fit and stronghold. Quality Materials – This collar uses genuine real leather which has been handcrafted. The hardware is polished metal and comes with pre-made holes. The metal latch for the leash is a D-ring attachment made with solid rivets. A variety of collar widths are available from the smallest to the largest neck size. Personalization Feature – This collar can be personalized with a name or message stamped onto the leather surface; a very charming and unique feature that makes it stand out. Be sure to see details before checking out. Durable – Tough, thick leather material is a perfect choice for your Pit Bull. Features the lasting quality of leather with handmade workmanship. This collar will endure the strength and athleticism of the rugged pit bull breed. Summary: Choosing a leather collar for your Pit Bull will compliment their natural beauty and strength. The width of the collar gives support for a Pit Bull’s neck area and reinforces a timeless rugged look. Check BlackJacks Leather Dog Collar now from Amazon! Here is a collar that is equal parts rough and tough, as it is playful and sporty. Made with comfortable heavy-duty nylon, a ton of notches to give your best buddy a perfect fit and several fun colors to choose from. Pit Bulls require a collar that is extra-wide to help disperse pressure and this nylon collar provides that support. The everyday practical wear of a nylon material provides an added bonus of wash-ability, making this heavy-duty nylon collar perfect for the adventurous owner. Durable material and construction – To start, this collar has a double buckle and reinforced buckle holes making the fit and ease of putting it on very simple. Pit Bulls need high quality, extremely tough nylon that will last. The heavy duty nylon used on this particular collar delivers superior quality. Stainless steel metal hardware will not rust or tarnish. Extra wide comfort fit – Sizes range from Small 1.5 inches to XXXL- 2 inches (23 to 27 inches) Extra-wide collar dimensions give leashed Pit Bulls extra comfort from pulling and neck strain. Washable and lightweight – Owning a washable collar is a must for outdoor dog lovers! One hike through a puddle and brush will give you thanks that this collar is so easy to clean. Your best friend will love the lightweight wear that comes with a nylon and so many fun colors to pick from too. Summary: For everyday wear, this is a go-to collar. Multiple colors and lightweight, this heavy-duty nylon collar can be tossed in the wash and withstand the wear and tear of an active dog. Check Bully’s Pitbull Collar now from Amazon! Who can resist a golden collar for their majestic Pit Bull? You will definitely get loads of compliments with this fun fashion collar. Gold says refinement and status, a fashion statement that says high quality. However, this gold has the price and practicality of stainless steel? This fun collar uses a solid 316 L stainless steel metal that is rust-free and tarnish-free. A unique 19 MM collar with all the comfort and strength and a perfect touch of luxury. 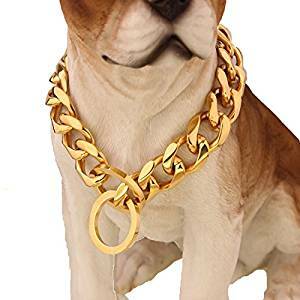 Consider this golden slip-chain dog collar an excellent choice for both your own pit bull, but also special enough to make an excellent gift for pit-bull owners in your life. The black velvet pouch the collar comes packaged in adds a thoughtful touch for a lovely gift for dog owners. Fashion statement – Have some fun while taking your Pit Bull bestie out on the town. Allow the royal gold-link collar to speak for itself as you add a bit of wow to your daily walks. Comfort and quality – The smoothly polished links won’t catch or pull on dog hair, and the solid Stainless Steel won’t irritate, rust or tarnish after being exposed to normal weather conditions. Multiple sizes – Sometimes getting the right size collar can be a challenge. Use the manufacturer’s suggestions to measure your Pit Bulls head and under the chin for accurate sizing. Please see posted instructions for further details. Sizes range from 14-inch collars up to 34-inches. Summary: Have some fun with this gold collar made of no-rust stainless steel. A fashion statement collar, with quality materials and good design, is going to have your friends talking while your Pit Bull buddy enjoys all the attention. Check W&W Lifetime Dog Collar now from Amazon! You’ve probably noticed the important points I’ve highlighted so far with each collar, but there are additional features about your own dog you’ll want to think about when selecting the best pitbull collar. First, Pit Bulls have a special blend of traits. Whether it’s their powerful athletic abilities, their own individual personalities or even their age, these qualities will vary from dog to dog and be quite different for every pet. Of course, as the owner, you too have needs and habits that should be considered when selecting from this collection of quality Pit Bull collars. Remember, it’s quite common to get a few collars to fit the alternating needs and seasons in a dog’s life. Let’s face it, you probably don’t wear the same clothes every day, so why shouldn’t your dog friend have collars to fit a multitude of occasions. With these additional thoughts in mind, here is a run-down of questions and areas to consider that will guide you in making the best fit for your Pit Bull and their unique needs. Weather Resistance – Does your dog tend to pull? Do they love to romp around through the water and mud? In this case, a water-resistant collar is a way to go. An adventurous dog benefits the most from a collar that can be tossed into the wash and used over and over. Think nylon and wash-ability. Safety and Visibility – Do you enjoy going out in the early morning or evening where safety and visibility are poor? Then collars with reflective components and safety features should be a top priority for you. Another possibility could be to pair a safety collar with a similar leash and optimize others ability to spot you and your dog from safe distances. Comfort/ Wear-ability – Do you prefer to have a collar for everyday wear? Then comfort and activity level should be prioritized. If your Pit Bull has additional neck issues or sensitivities, then padded collars with soft materials are the answer. Don’t forget with everyday collars, having a few colors to choose from depending on changing moods and seasons is perfect. Fashion/Style – Do you prefer a trendy look or enjoy having your dog make a bit of a fashion statement? Then go for a collar using stainless steel smooth no-pinch metal-link collars, or perhaps the classic elegance of a genuine leather collar with personalized branding. Lastly, don’t get confused by knock-offs and lesser quality collars out there. Cheap materials aren’t going to cut it for the rugged and athletic pit bull dog type. Trust me, you don’t want your dog wearing uncomfortable collars that poke and irritate, change colors or fall apart. The most important part of this list of best collar for Pitbulls is that you’re thinking about the highest quality love and care for your friend. As you already know, their happiness is your happiness.